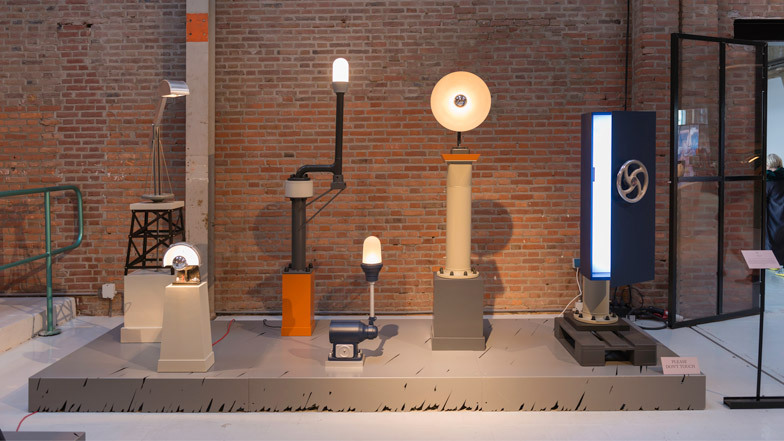 Dutch Design Week 2014: Eindhoven designer Joost van Bleiswijk has collaged together found objects and old machine parts to make this range of furniture and lighting. The Collage project started two years ago, when Joost van Bleiswijk began collecting leftover items from around his studio. He picked up discarded pieces of industrial equipment and tools, amassing a set of individual unused pieces. Van Bleiswijk decided to repurpose these items by combining them into useful furniture and lighting products. "As we were cleaning up the mess, I used many items we found in the workshop and combined them into several objects," said Van Bleiswijk. "Old machines, that were ready to be thrown away, ventilation pipes, and leftover pieces of wood and paint formed the base of these unique items." Different metal elements are bolted and welded together, creating pieces that stack up like totem poles. A curved section of ductwork is used to hold a rectangular blue cabinet off the ground. The cabinet door is opened by pulling a valve wheel stuck on the centre of the door. The assemblage sits on a grey-painted wooden transportation palette. Another piece of beige pipe supports an orange platform, on which a lamp with a copper disk diffuser is placed. Part of a pylon-like stand from one of the designer's Construction Lamps is sandwiched in a tower between a base plinth and a metal balanced-arm lamp on top. Another lighting piece comprises an illuminated tube secured at either end by a pair of clamps, stood on a metal bracket bolted to a four-legged base. The pieces are on display in the studio space that Van Bleiswijk shares with partner and fellow designer Kiki van Eijk. The duo's combined exhibition is open for the duration of Dutch Design Week, until 26 October. Both have also designed rugs for ICE International that are on show for the event.